Implementation of clean water, adequate sanitation, and good hygiene practices are important parts of a comprehensive effort to alleviate poverty and elevate a community or a culture to a higher level of self reliance and prosperity. The introduction of appropriate technology that is culturally accepted, commonly utilized, and easily maintained by those who use it most helps ensure the sustainability and longevity of the changes that the community undergoes. Lasting change, however, does not come through the introduction of technology alone. Change occurs when behaviors change due to a change in attitude. We know this from observing our own lives and the lives of people we know. Nothing really changes in peoples’ lives until their thinking changes. The path to lasting change, therefore, begins with education. Improvement in water, sanitation, and hygiene, begins with teaching hygiene and the promotion of good hygiene practices. Education changes the way we think. Thoughts become behaviors, and behaviors become habits. Those habits become the way of life for a group of people, and lasting, cultural change takes hold. I was recently in the south-central part of Kenya working on an agricultural water management assignment. One thing I noticed there was that hand washing was conscientiously practiced by everyone. Eating with your hands was also commonly practiced. In an eating establishment (I guess you could call them “restaurants”) waiters came by with a bowl and a pitcher of warm water and soap. All the patrons would wash their hands with soap and water before the food was served. Also, at times when we (the Americans) used our Purell hand sanitizer, comments were often made to the effect that “there, now your hands are washed”! Hand washing had become the culturally accepted norm. I am sure that eating with the hands was going on for generations before anyone thought of washing their hands first. So, somewhere along the way, through teaching hygiene practices, people became educated in the importance of hand washing. Learn how to build and use a Tippy Tap! 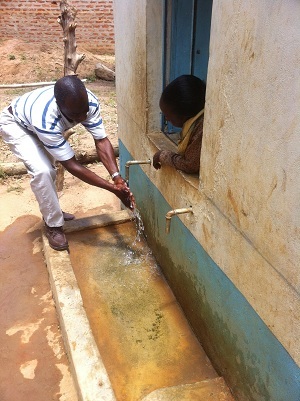 Inexpensive technology for efficient and hygenic hand washing! Another thing I noticed was that there were tons of schools. When driving through the countryside, you could figure out where you were by the signs for the schools. You may not have any idea what village was coming up until you saw a sign for the primary or secondary school. Villages did not necessarily have signs, but schools always did. This indicated to me the value that Kenyans placed on education. Every school had a uniform that was unique in color and identified students as belonging to that school. Also, school children all had their heads practically shaved clean; boys and girls alike. This was done for the prevention of lice. Shaving the heads of the school children just eliminated the issue of lice altogether. Again, I am sure that the head-shaving custom was learned along the way, through teaching hygiene. The the importance that Kenyans place on education is something that has grown over time and has instilled a good hygiene mindset. Education changes us. The principle of education-changing- attitude-changing-behavior is true when it comes to all aspects of teaching hygiene. Good hygiene practices do require good, clean facilities that are used in the proper and hygienic manner. But education and change from within is the engine that drives lasting change. Education that facilitates a change in attitude and practice must be practical and practice-oriented. Understanding why good hygiene is important is an excellent place to start. But, people need to know HOW to be hygienic in their daily activities. So, good practices arise out of an educational approach that is practice oriented, and that builds skills and changes attitudes, as well as providing knowledge. For a hygiene education program to be effective, especially in a relationship-oriented, communication-oriented, and interactive society, some basic criteria need to be taken into account. Lessons that are taught must be practical, in the mind of the student, and must link their prior knowledge and experiences with new information, new attitudes, and new behaviors. Lessons work best, especially in inclusive and relationship-oriented cultures, when they are creative, participatory, and action-oriented lessons. Students, whether they are adults or children, must feel that they are “doing something” and not just listening to a “teacher”. The locale and culture must be a prime consideration and the lessons should be adapted to be relevant in the local context. The messages must be simple and understandable in the local context, capable of being understood from the student perspective, and should stimulate students to get involved and reflect upon their current behaviors. Repetition and reinforcement are also important when teaching new concepts and practices. Translators should be used if necessary and communication methods like participatory song and dance can be successfully incorporated. Taking these criteria into account, it is evident that the way we, in America, are used to being taught, is probably not the most appropriate method for teaching in developing countries. Methodologies for teaching hygiene should stimulate students in recognizing and understanding the importance of hygiene issues in their own daily lives. The actual hygiene behaviors practiced and the actual beliefs and attitudes of the students, as well as their surroundings, and the environment they live in, should be the starting place in developing any program for teaching hygiene. Students cannot grow into new standards and improved lives without understanding where and how they currently live. So how would you go about discovering where your students are “coming from” in order to develop hygiene education that will improve their lives? It’s very simple. First of all, it is all about relationships. Know your students. The more time you spend living with them and experiencing their daily lives the more in touch with them you will be. This is another situation where the volunteer/local partner/beneficiary model can be so effective. Instead of us going to South America and teaching hygiene to Brazilian children, maybe it would be better if we train Brazilians to teach Brazilians. You can introduce the educational methodologies to capable local trainers, and let them adapt and create lessons for the students. Local partners will have knowledge about the students’ ways of communicating and learning that we could not even imagine. Based on local understanding of the students’ attitudes, knowledge, and practices, they can then adapt lessons that move the students toward creating new understanding, new attitudes, and new behaviors. Understand that I am using the word “student” in a very general sense. It has nothing to do with age, although teaching methods should be age appropriate. It has nothing to do with being in a “school”, although teaching a group of students in a school is way different than teaching a community-base organization or some other group of adults. The important thing is to know your students and adapt the lessons to their particular culture, environment, and learning style. That is what teachers do. In the process of learning about good hygiene practices, students will become familiar with techniques and technologies that will help facilitate those practices and make personal hygiene a real and practical part of their lives. Teaching about the pathways of disease transmission, for example, leads to a discussion of the dangers of open defecation and the health advantages of latrines and other sanitation facilities. Understanding the origins of waterborne diseases will open discussions about water filters and household water treatment and storage (HWTS). Because hygiene education is so basic to understanding the importance of other WASH principles, strategies, and technologies, it is the logical starting place for any WASH development effort. There are a couple of resources that will assist anyone who wants to implement a hygiene education program or develop hygiene education lessons. I have included links to the PDF files below. Remember that no lesson will work in all situations. Sensitivity to and understanding of the lives, backgrounds, culture, thinking, and learning styles of your students should persuade you to adapt everything for their benefit. 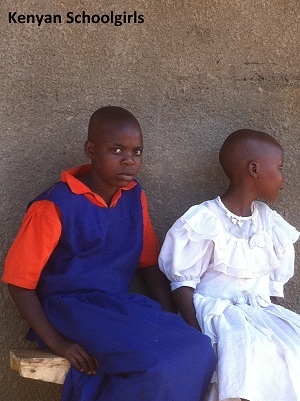 Return "Home" from "Teaching Hygiene"
Building and Using a "Tippy-Tap"